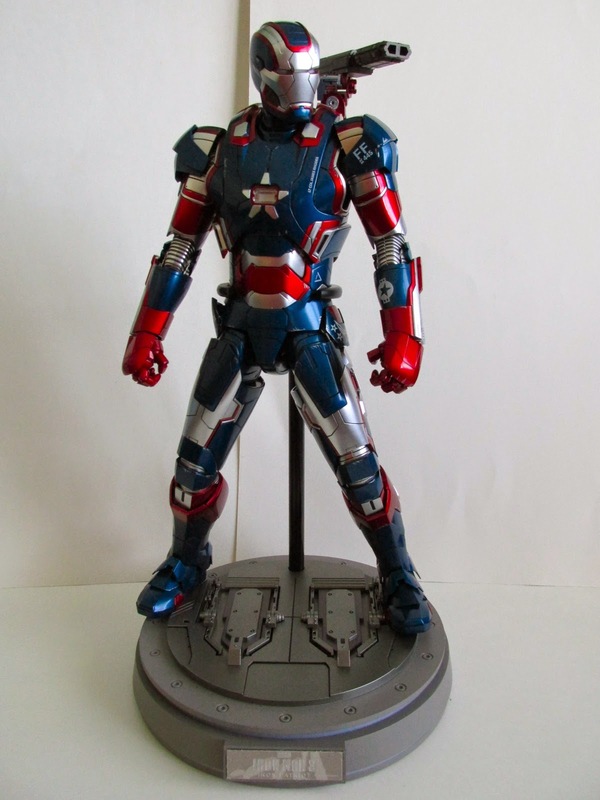 Hot Toys finally releases the Iron Patriot die cast 1/6th scale figure. This is technically the first die cast figure in Hot Toy’s die cast figure line, but got delayed…as usual. This is another great figure from Hot Toys and sets another bench mark in their Iron Man line. This is essentially a repaint of War Machine Mark II that was released earlier this year. Some may say a repaint of anything is just another way to milk a toy franchise, but this repaint essentially makes this a brand new figure. The red, white, and blue, color scheme really makes this figure stand out from its predecessor. The paint job on this figure is truly amazing with its metallic finish and gives a real shine to this figure. The Mark II used more of a flat, non metallic color paint job and hence is much more subdued. There is also great detail on the battle damage paint job for this figure. In many areas, you can see scratches, giving the illusion that this armor has been through some battles. Accessories wise this comes with a bit more than the Mark II. It comes with a pair of articulated hands, a pair of repulsor hands, a pair of fists, one right hand in a salute pose, one gauntlet with armed gun, extra head with Don Cheadle’s face in the helmet, one normal face plate, one “opened” face plate, base, and a stand. The face sculpt of Cheadle is as usual on par with what you would expect of Hot Toys. This figure comes with two face plates, which seems kind of odd since they are essentially the same thing, but upon closer inspection there is a small difference. One face plate is the usual looking faceplate that comes with all Iron Man figures while the other face plate has raised cheek bones. The raised cheek look is what the instruction manual calls its open look. Apparently, when the face plate opens up the cheeks raise up and that is how it opens up. Was this seen in the film? Maybe upon close inspection, but still kind of an odd inclusion since it is such a minor detail. Still, this is a nice inclusion and shows Hot Toys dedication to the finer details. 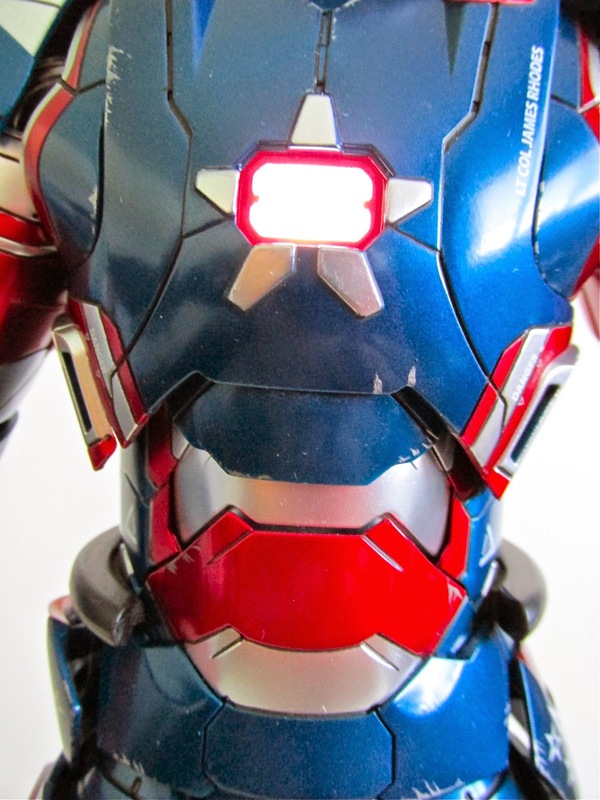 This figure also lights up and like the Mark II the lights on the chest and eyes don’t seem to be that bright compared to other Iron Man releases in the past. Like the Mark II, you have to install the batteries that comes with the figure. It also comes with a small screw driver that thankfully worked a bit better this time around. Overall, this is a great figure and doesn’t feel like a carbon copy of War Machine Mark II. 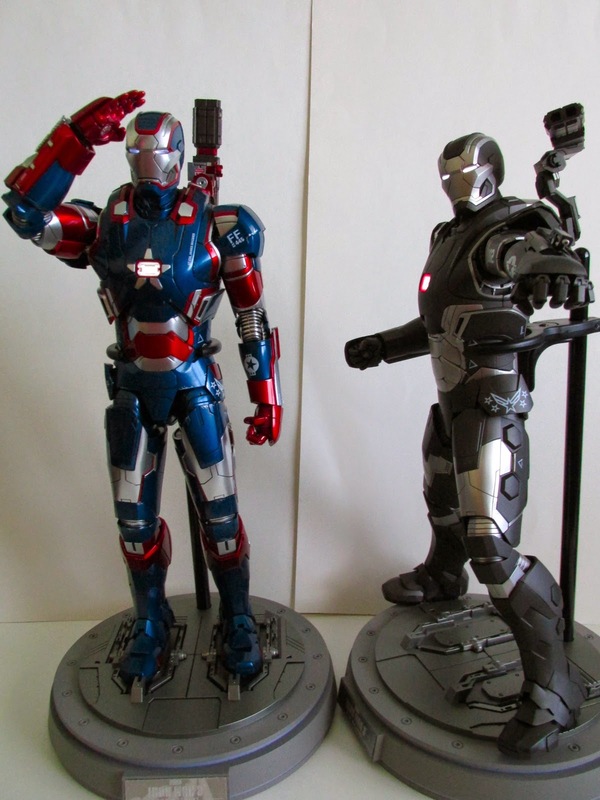 When standing Iron Patriot next to War Machine, the two figures feel very different, and it is nice to feel a genuine since that this is not some cheap, low quality repaint.